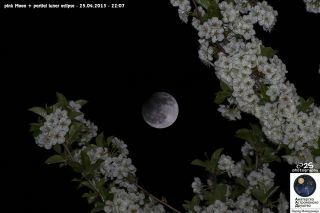 Flowering tree branches delicately frame the partial lunar eclipse of April 25, 2013, in Ohrid, Macedonia. Photo provided by astrophotographer Stojan Stojanovski. The moon toe-dipped through the Earth's shadow in a partial lunar eclipse Thursday (April 25), but stargazers around the world still captured surprisingly spectacular views of what they expected to be a minor celestial event. Partial lunar eclipses like Thursday's event occasionally receive a bad rap because they aren't nearly as dramatic as the red glow of the moon during a total lunar eclipse, and some times they aren't even noticeable. That, however, wasn't the case today. "I am still stunned," Slooh President Paul Cox said during his group's webcast. "I thought we were going to have trouble discerning any shadow at all from this lunar eclipse." Instead Cox and his fellow co-hosts were met with gorgeous shots of the Earth's shadow passing over the face of the moon. During the eclipse, a small upper left-hand section of the full moon was totally obscured, a beautiful and unexpected sight. Astrophotographer Gianluca Masi sent in a photo of the partial lunar eclipse of April 25, 2013, taken at the Virtual Telescope Project 2.0, Ceccano, Italy. "It's only more recently that I've become a fan of lunar eclipses because they're beautiful in their own right," solar scientist Lucie Green of the Mullard Space Science Laboratory in the United Kingdom said during the Slooh webcast. This particular lunar eclipse defied expectation partially because the satellite only passed through a small portion of the umbra of the Earth — the innermost shadow of the planet that prevents any direct sunlight from reaching the moon. A total lunar eclipse occurs when the full moon passes directly within this inner shadow, but those are rare. The moon is slightly tilted in its orbit around the Earth, preventing it from orbiting on the same plane as the planet. If it did, we would have a total lunar and a total solar eclipse every month. "Amazing view, the moon, even with such small eclipses, it always breathtaking," astrophysicist Gianluca Masi, who hosted the Virtual Telescope Project webcast today, told SPACE.com in an email. Typically, partial lunar eclipses can be difficult to see at all, but Thursday's event not only impressed lunar observers, but also photographers hoping to catch a glimpse of the moon and another celestial body. "Like every year we capture this events," photographer Stojan Stojanovski said of the eclipse. "I may say this year is special because we have Saturn near moon at the same time with eclipse. This night will be long first because we take photos from eclipse, second level will be watching and taking some photos of Saturn." Saturn will appear near the moon tonight. If you hold your closed fist at an arm's length toward the night's sky, the ringed wonder should be less than "half a fist" way from the moon. If weather permits, the planet will look like a bright star to the upper-left of the moon and should appear all night long. The planet is close to a point in the night sky called "opposition," when it will be directly opposite the sun. Saturn's opposition will be the next broadcast from Slooh carried on SPACE.com this Sunday (April 28) during its peak. Thursday's eclipse was the first of five eclipses of the moon and sun in 2013. The next event, an "annular" solar eclipse will make the star look like a cosmic ring of fire on May 10. Editor's note: If you snap a great photo of the April 25 lunar eclipse or any other celestial event that you'd like to share for a possible story or image gallery, send photos, comments and your name and location to managing editor Tariq Malik at spacephotos@space.com. Follow Miriam Kramer Twitter and Google+. Follow us @Spacedotcom, Facebookand Google+. Original article on SPACE.com.